When brothers Jack, Sam and Eric Hendler founded Jack’s Abby Craft Lagers in 2011, the craft beer community was obsessed with hoppy and aggressively bitter west coast-style IPAs and boozy imperial stouts. Naturally their decision to launch as a lager-only brewery was met with some skepticism. While craft beer pioneers like Sam Adams and Brooklyn Brewery made flavorful takes on traditional lager styles, most of the craft beer boom of the last decade has been fueled by ales. This makes a lot of sense for practical reasons, properly made lagers need to ferment for longer times at lower temperatures compared to ale styles, which lowers the overall output of a small brewery. Many new craft connoisseurs also equated lager beer to the light, flavorless macro beer that craft brewers were working so hard to compete against. When Jack’s Abby launched they aimed to redefine what lager beer could be by introducing a variety of full favored lager styles that would satisfy beer geeks who love big and bold flavors as well as traditionalists who fell in love with the diverse lager beers of central Europe. While lager styles cover a wide range of flavor profiles, none of the traditional lager beers would be considered hop-forward, especially compared to the hoppy beers that drive much of the volume in craft beer. To help attract the hop heads Jack’s Abby bucked tradition and brewed several India Pale Lagers, beers that combine the crisp and clean profile imparted by lager yeast strains with heavy doses of popular new world hops. Their first “IPL” was flagship beer Hoponius Union, a pale lager brewed with copious amounts of American hops. This beer was a revelation to many drinkers, completely redefining what a lager could be. Hoponius Union was actually one of the first local beers that I fell in love with, and it was a key beer in my journey from adventurous drinker into a full-blown beer geek. If Hoponius Union was Jack’s Abby’s lager equivalent to an IPA then Framinghammer Baltic porter was their answer to popular imperial stouts. While Baltic porter is a traditional lager style, and the standard issue of Framinghammer is a stellar version of the style, Framinghammer sets itself apart with the diverse barrel aged variants. In addition to a Bourbon barrel aged version of the beer that holds its own against any barrel aged stout, Jack’s Abby makes coffee, vanilla, cocoa-nut, PB&J (yes, you read that right), and many other unique variations of the beer. 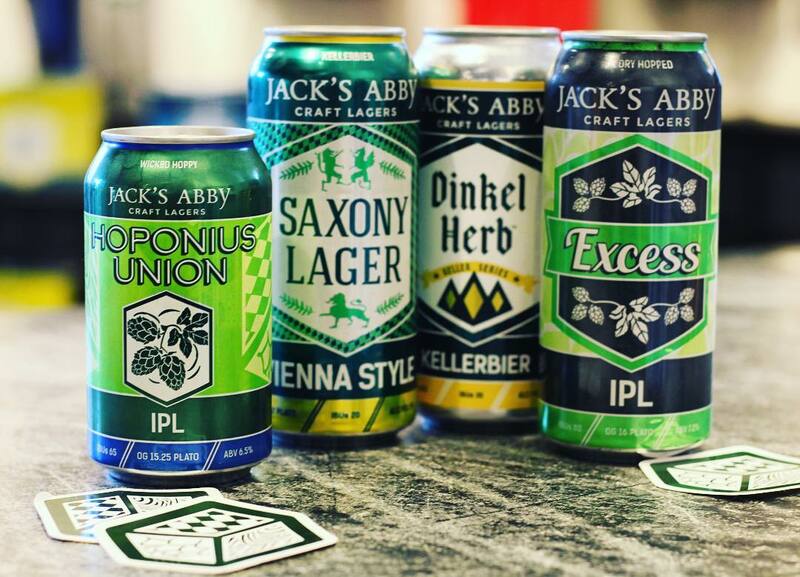 Beers like Hoponius Union and Framinghammer helped introduce Jack’s Abby to beer geeks that otherwise might have shied away from a lager only brewery. While these creative lagers are key parts of the Jack’s Abby brand, they have also had success with a range of traditional lager styles. Jack’s Abby has probably made a version of every lager style you’ve heard of, and many that you might not have. The Hendler brothers knew when they launched the brewery how popular lager beers are world-wide, and how few high-quality lager options were available in this area, so they saw an opportunity to show craft beer fanatics how good these beers could be. It put Jack’s Abby in a good position with the recent return to prominence of lighter lager styles. Now it seems like every big craft brewery is trying to get a piece of the pale lager market, and Jack’s Abby is well positioned with popular beers like House Lager and Post Shift Pilsner. Over the last few years Jack’s Abby has seen some major changes. In 2015 they moved out of their original location and into a beautiful new 67,000 square foot brewery in Framingham. The new brewery features a 60 BBL brewhouse along with a German style beer hall with 24 beers on draft and an extensive menu (try their wood-fired pizza, it is amazing). 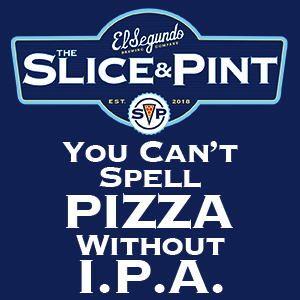 One of the best things about the brewery, at least for people in my stage of life, is that it’s very family friendly, I have been many times with my kids and they love the food, the atmosphere and the great service. In 2016 Jack’s Abby launched the Springdale Barrel Room, right down the street from the new brewery. While every beer brewed under the Jack’s Abby label is a lager, Springdale exclusively brews ales. 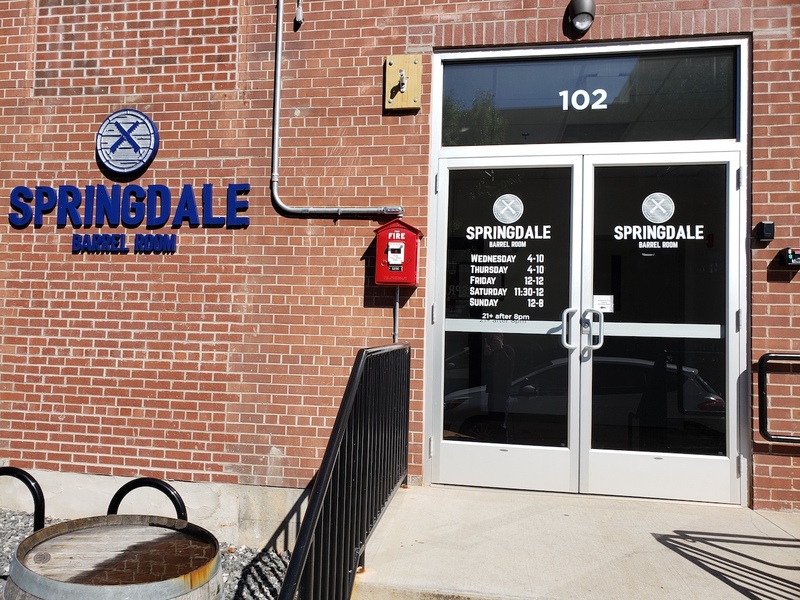 Springdale makes a wide variety of beers, but they seem to specialize in two popular styles of beer that can’t be brewed by a lager-only brewery, New England style IPAs and barrel aged sour and wild ales. Springdale has their own taproom loaded with games and communal tables, plus tons of different beers on draft and available to go in growlers, bottles and cans. Springdale’s barrel aged beers cover the gamut of flavors from funky to fruity, slightly tart to aggressively sour. If you are still getting the hang of sour and wild ales it is a great place to grab a flight, you can taste a wide variety of complex beers that fall under the “sour” umbrella. While the beers coming out of the barrel room showcases their creativity and passion, Springdale’s most popular beers are their extensive lineup of hazy and hoppy New England style IPAs. While it would have been easy for an established regional brewery like Jack’s Abby to jump on the NEIPA train and scale up a couple beers for quick sales, Springdale has been very careful with their NEIPAs. For the first year of operation these beers were all brewery-only, allowing the brewers to fine-tune the recipes and understand the shelf life and storage conditions for the notoriously finicky style. The beers are now available in distribution, but each is coded with a brewed-on date, a best by date (60 days after packaging), and a directive to store cold (which makes a huge difference in the shelf life of the style). I would like to see every brewery take the same approach with their hoppy beers. 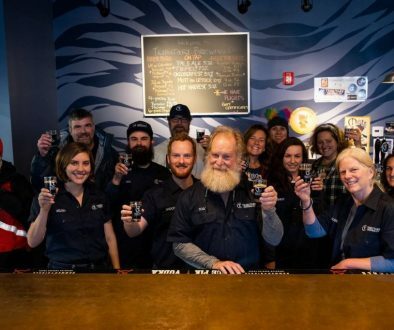 Jack’s Abby and Springdale beers now have regular distribution in 8 states, throughout New England plus New York and Pennsylvania, but they have occasional drops in many other areas of the country, usually as part of festivals or collaborations. They are planning to continue to grow, in 2018 they will brew around 60,000 BBLs of beer and the brewery is big enough to eventually grow to more than double that volume. Jack’s Abby understands the challenges of being a regional brewery in a time when beer is becoming more and more of a local product, and they aim to please their regulars and the beer geeks who are trying a new beer every week. They are continually fine-tuning the lineup to keep things fresh. Jack’s Abby recently launched a series of Kellerbiers, small batch beers brewed with traditional techniques, naturally fermented and packaged fresh and unfiltered. Jack Hendler returned from a trip to Germany where he secured contracts on top quality ingredients from German suppliers, allowing the brewery to continue to produce the most authentic versions of the beers they love. They have also re-imagined Excess IPL, one of their popular hoppy lagers, it is now being brewed as a series of single-hop lagers. You can expect Jack’s Abby and Springdale to always evolve, retiring or re-working some beers while continuing to innovate and adapt. I look forward to seeing what they come up with next! Before I dive into my favorite beers from Jack’s Abby and Springdale I have one personal request to the readers here. I love bocks and dopplebocks, they are some of my favorite lager styles. When I talked to co-founder Sam Hendler he agreed with my love of the style but said that Jack’s Abby has always struggled to sell those beers when they brew them. So, the next time Jack’s Abby releases a bock or doppelbock please grab some and try, the mixture of rich malt flavor and clean lager profile makes these beers shine and very few local breweries even attempt these styles. With that in mind, enjoy a mug of some delicious lager this October. Prost! Mass Rising and Kiwi Rising: Jack’s Abby was one of the originators of the “IPL” a style that features the intense hoppiness of an IPA with a clean lager body and finish. These two beers are double IPLs, each beer features as aggressive hop bill that would satisfy any hop-head, and they are insanely easy to drink for big beers. Framinghammer: A Baltic porter that cracks double digit ABV but is dangerously drinkable. 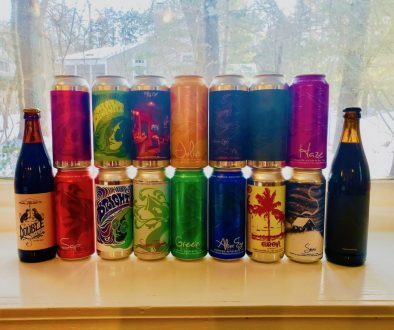 Many beers that feature this much booze become one-note, where the alcohol overwhelms the other flavors, but Framinghammer has full dark malt flavors without tasting “hot”. Framinghammer also comes in a few varieties including bourbon barrel aged, vanilla, coffee and PB&J. Smoke and Dagger: In general, I am not a fan of smoked beer. I love beer, I love bacon, I don’t want my beer to taste like my bacon. This beer is the exception to the rule, full dark malty flavor with a subtle smokiness that adds depth and complexity without overpowering the beer. If you get a chance, try this beer on nitro, the flavor really pops and the mouthfeel is unreal. Copper Legend: A quintessential take on a German marzen, the traditional style of Oktoberfest. Copper Legend features rich malt flavor in a crisp and easy drinking body without the overpowering sweetness that ruin too many American marzens. A go-to beer every fall. House Lager: Jack’s Abby has been at the forefront of craft beer’s embrace of pale, easy drinking but full-flavored lager styles. Their flagship Helles lager is perfect for everyday enjoyment, light and refreshing but still complex and nuanced. Good N’ You: Springdale has made a huge variety of New England style IPAs, and Good N’ You is my personal favorite. This hop bomb is loaded with Citra and Galaxy hops, imparting the aromatics and flavor you love in an IPA along with the soft bitterness that the substyle is known for. Kriek Mythology: One of the strengths of the Springdale label is their flavorful, interesting and approachable sour beers. Kreik Mythology is their take on the sour cherry beers from the Flanders region of Belgium. A great mix of flavors from the fermentation, the cherries and a present but not overpowering acidity. Desert Solitaire: I love wild ales that are well done because they can be among the most complex and delicious beers you can buy. Desert Solitaire has all the things I look for in a wild ale, funky Brettanomyces, enough tartness to add character without being overpowering and an additional twist, the addition of spelt and rye to the malt bill. The combination makes a beer with layers of flavor that all work together. Kriek is lambic-based from the Pajottenland region; Flanders region of Belgium is known for Flanders Red and Oud Bruin. Both styles from Flanders have cherry-like notes from the interaction between the malts and wild yeast, but you do not always see actual Cherries added (Rodenbach Alexander is one and there is now a cherry Duchesse de Bourgogne, may be more those are just two off the top of my head). Thanks for passing along the info! I took the description right from the beer label/Springdale website. These beers always tend to be somewhat loose interpretations of classic Belgian styles, so there is a tendency to blend techniques from different regions. Springdale’s Pearly Wit is another great brew – great mix of citrus and spice.